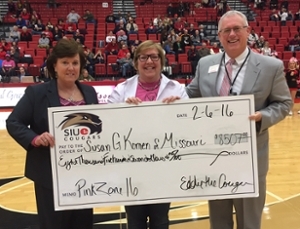 The SIUE women’s basketball team raised more than $8,500 at its 2016 Pink Zone game Saturday, Feb. 20, against UT Martin at the Vadalabene Center. SIUE Head Coach Paula Buscher, her basketball staff and the Cougars annually raise awareness and funds for the St. Louis affiliate of Susan G. Komen for the Cure. A variety of fundraising activities included Pledge the Runners for Remembrance. Individuals such as SIUE Interim Chancellor Steve Hansen and Director of Athletics Brad Hewitt ran or walked in honor of those who have lost the fight, are still fighting or have won the battle. Photo (L-R): SIUE women’s basketball Head Coach Paula Buscher, Executive Director Susan G. Komen/Missouri Helen Chestnut, SIUE Director of Athletics Brad Hewitt.